Canada’s 3x JUNO (Canada’s Grammy) nominees/3x CFMA winning ambassadors of musical diversity, Sultans of String, have expanded the traditional notion of Christmas music with their new, genre-hopping disc, “Christmas Caravan” available today via McKhool/CEN/The Orchard, a division of Sony Music. Recorded and co-produced with JUNO Award winning engineer John ‘Beetle’ Bailey. 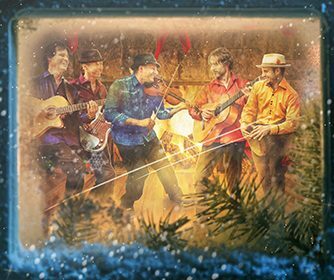 Joining them on Christmas Caravan is 6x Grammy winning Paddy Maloney (The Chieftains), Ruben Blades & Luba Mason (Panamanian 7 Grammy and 5 Latin Grammy Award winner), platinum-selling jazz vocalist Nikki Yanofsky, 2x JUNO/Grammy Winner Alex Cuba, Benoit Bourque of Quebec’s Bottine Souriante (3x JUNOs, 4x Gold, 3x Platinum records), Sweet Honey in the Rock (Grammy winning all-woman, African-American a cappella group), Cameroon’s Richard Bona (Paul Simon, Herbie Hancock), Canada’s singer to the stars Rebecca Campbell (Emmylou Harris, Alanis Morissette), singer Mary Fahl from NYC’s October Project, a recording collective of Turkish Roma violinists in Istanbul, Sudanese-Canadian singer Waleed Abdulhamid, Nashville-based JUNO Award winning country singer Crystal Shawanda, sitar virtuoso Anwar Khurshid, and hang drum player David Charrier from France. Billboard charting Sultans of String would like to acknowledge funding support from the Ontario Arts Council, an agency of the Government of Ontario. This project is funded in part by FACTOR, the Government of Canada and Canada’s private radio broadcasters.